The Aurealis speaker cables use 20 awg solid core wire as their basic building blocks. Twenty gauge wire is the broadest gauge wire that has no upper frequency roll-off within the audible range. It maintains clarity across a broad frequency range up to 27 kHz, and provides a solid well-defined bass. Multiple strands of 20 awg are used to build up thicker gauge cables. Capacitance and inductance are kept low by the the way the wires are twisted and dual insulation in solid Teflon (PTFE) and micro-porous Teflon (ePTFE). The current capacity of the wire is critical in determing the size of the speaker cable you need. If the overall gauge of the cable is too small for the power relationship between ampifier and speakers, the bass response will be less powerful than it could be. (However, a thick gauge multi-strand cable while providing enough current for a prominent bass will result in a fatter sounding bass and loss of detail at the high end.) Cable resistance is largely dependent on length and only really needs to be checked, once the current capacity needed is worked out. In most cases the, over standard speaker lengths, resistance will not be an issue when the gauge that meets the system's current requirements is used. 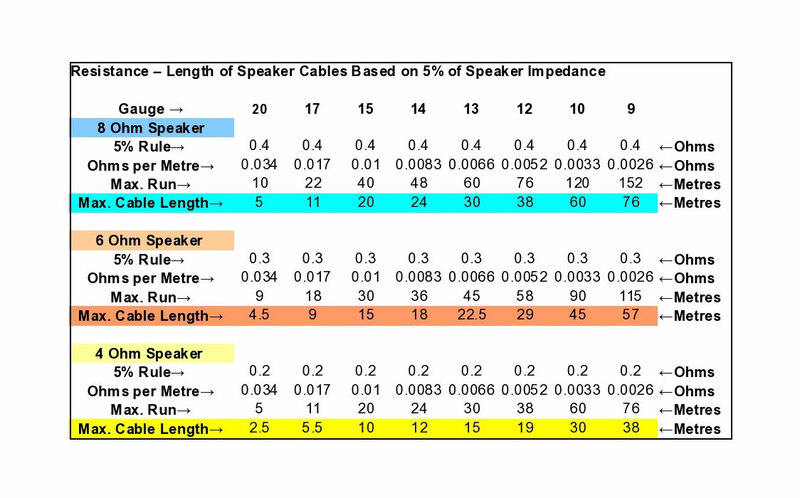 Table 1 below shows the maximum current capacity that a speaker cable needs to carry for a range of amplifier power ratings into 4 Ohm and 8 Ohm speakers. Current capacity for 2 Ohms and 6 Ohms is also shown for comparison. Click on the table to enlarge. 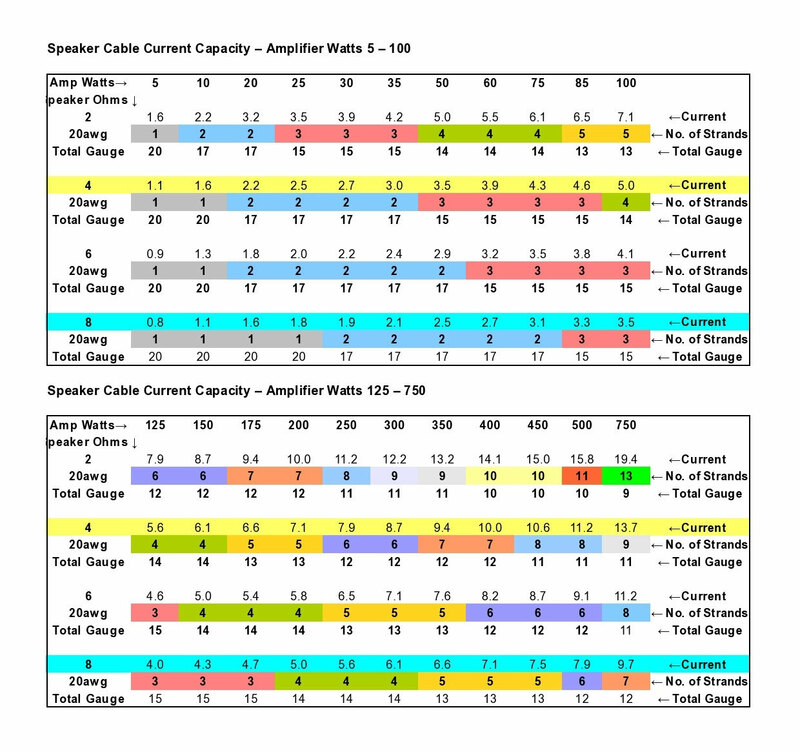 As an example reading across the first row and down the first column, a 5 watt per channel amp will require a cable with a current capacity of 0.8 amperes when matched with an 8 Ohm speaker. The figure below 0.8 figure, indicates that 1 strand of 20 awg (in the signal path) is sufficent to carry the current needed. By contrast a 150 watt per channel amplifier will require a cable with a current capacity of 6.1 amperes. This requires 4 strands of 20 awg in the signal path and equates to an overall gauge thickness of 14 awg. This matches to the Aurealis speaker cables that use 4 twisted pairs of 20awg per channel (UP420e and SP420e). What happens if I use a speaker cable that has less current capacity than my system might need? Not a lot or quite a bit depending on your listening tastes. Even a single strand of 20awg is safe to use with 11 amperes of current. It performs best carrying only 1.5 amperes of current, but it can safely carry more. If your main priority for your system is clarity across the mid-range, good upper end detail and a well-defined bass, then using a lower gauge cable than needed will achieve this. The downside is that the bass will have less power than it could and consequently will be less prominent in the musical landscape presented. But if you want to capture the best bass response your system is capable of then it's important that the speaker cable has sufficient wire to carry the current needed. A common rule of thumb is to keep the resistance of the speaker cable below 5% of the speaker impedance. For 8 ohm speakers this is 0.4 Ohms and for 4 Ohm speakers it's 0.2 Ohms. Table 2 below shows the maxium length of cable by gauge which meets this guideline. Click on the table to enlarge. The Max. Run in Table is the total length of wire in the signal from the amplifier to the speaker and the return path from speaker to amplifier. The speaker cable length is half this amount. 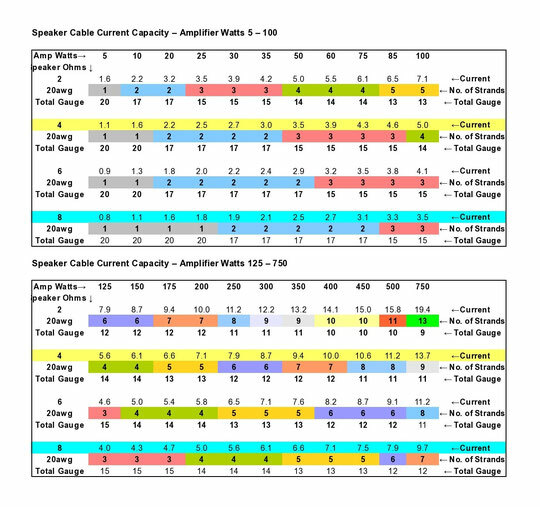 While Table 2 shows that resistance is not a significant issue in the usual runs used for 2-way speaker systems. 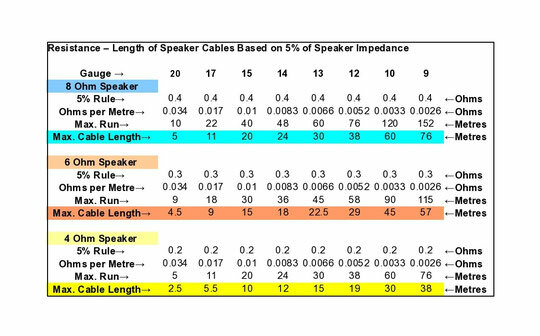 Perhaps more accurately, it would be better to say that using resistance guidelines is not the most accurate way to choose the most suitable speaker cable for relatively shorter cable runs.